toxins are eliminated from the cells naturally. When the vibrations stop, fresh nutrition is absorbed into the cells to fill the space made by the elimination of waste materials. When these processes are repeated, enough hormones are supplied to the skin cells that the cells are reactivated. When Negative Ions are used, it greatly improves blood circulation and it penetrates deeply into the derma layer and basic cell layer as well. This removes wrinkles, contracts the sweat pores, and makes the skin supple. The stimulus of Negative Ions deeply massages face muscles, removing deep wrinkles. The Rejuvena sL was developed considering various characteristics of the body. So, various effects can be achieved with only one massage. Especially, you will see the better results of moisturizing and preventing wrinkles with the Ionized Vitamin C.
Aged skin will become supple. Since ultrasonic waves stimulate skin muscles with vertical and centrifugal movements, ultrasonic reactivates the aged skin cells, making the skin supple and healthy, making a beautiful face surface. You will get clean skin. The major reason for skin problems is waste material in the skin cells, and a drop of metabolism of the skin cells. Ultrasonic Micro-Vibrations (30,000/vps) penetrates deeply into the skin eliminating waste material, and stimulating the metabolism of the skin cells so it will give you healthy skin. 5. Why Does the Human Age? Is there any possible way to maintain a youthful look? To satisfy the desire of women who want to keep a youthful look, new technologies to prevent aging have been developed. The cause of wrinkles will be decreased. The skin has a hard time absorbing nutrition. The remarkable effect of the Rejuvena sL High Tech Ultrasonic Skin Care System (which was developed considering the above physiological mechanisms) has been proven to reverse the aging process. Rejuvena is an excellent spa treatment and salons across the country are finding it's therapeutic massage is a big hit with their customers. 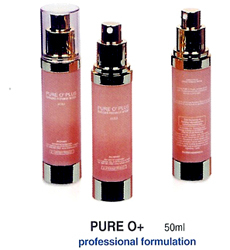 Richway PURE O PLUS, ionized mineral water will control your pH level and give you younger looking skin. This technologically advanced moisturizing protects the skin from damage and repairs the already damaged skin. 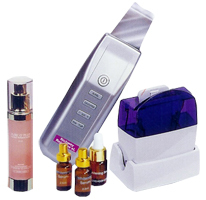 Directions: Spray before using the Rejuvena Ultrasonic or Negative Ions. Outward motion to face and neck, avoiding the eye area. Lavender has been extensively used in herbalism. An infusion of lavender is claimed to soothe and heal. Extract of lavender is claimed to heal acne. Lavender is frequently used as an aid to sleep and relax. It is also used in the treatment of skin burns and inflammation. Ther is scientific evidence to support the effectiveness of some of these remedies. Especially the anti-inflammatory effect. 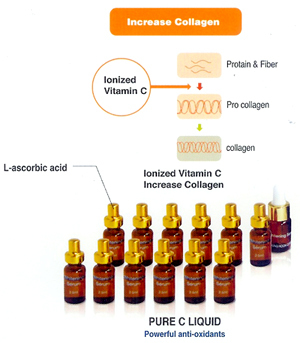 Pure C Liquid Advanced C serum is a unique, oil-free patented Vitamin C formulation that contains powerful anti-oxidants designed to help reduce the visible signs of aging and sagging skin. Directions: Use before using the Rejuvena lonzyme mode. Use outward motion to face and neck, avoiding the eye area. 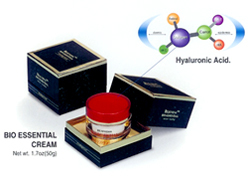 Essential cream is designed to reduce the appearance of sagging skin and wrinkles. Directions for use: Gently blend the cream over your skin, using long, smooth, upward strokes after finishing the ionzyme treatment. Clean and healthy skin starts with cleansing. The "sonic" mode helps to retrieve the original healthy skin by removing the old dead cells and other contaminations. 1. First, remove make up and wash your face. If possible, moisturize the horny layer with a steam towel or facial steamer (this step can be ommitted). 2. Apply Pure O+ (pH 6.5) to the skin. Push the power button. Push the sonic button. Choose high or low level by pushing the high/low button (a red light is high, blue light is low). 3. Gently massage. Apply the blade to your skin. 4. The blade removes the old cells and other toxic substances by slowly moving the blade against the skin (5-10 minutes). When Pure O+ runs out, apply more at any time. 5. When you are finished using the sonic function, turn the power off and then wash your face with a clean, cold, wet towel. By applying Pure O+ Ionized Mineral Water to your skin, a healthy, youthful glow will result. Reduces the appearance of fine, dry skin lines. A slight stroking motion on the forehead and cheeks, short and straight each 3 times, blade side. A gentle messaging of the T-zone & sides of the nose, 10 times, blade side. Message the area around the mouth using straight motion, blade side. Use a gentle stroke, 10 times, blade side. Gently message lines on throat with a down to up motion, 10 times (do not touch center area), blade side. The Negative Ion mode helps to absorb fat and waste cells deep inside pores. 1. Apply Pure O+ (pH 6.5) to the skin. Push the power button, then push the -ion+ button. Choose high or low by pushing the high/low button (red light is high, blue is low). 2. Apply Pure O+ to the skin. 3. Use it with the blade facing down, flat side. 4. Use it about 10 minutes. Gently message lines on throat with a down to up motion (don't touch center area), flat side. The Ionzyme mode helps the original skin absorb moisture and nutrients, after the old cells have been removed. The mixture of sonophoresis and ion tiphoresis allows the beneficial substances of cosmetics to be delivered more efficiently into the skin. 1. Apply Pure C Liquid to the skin. Push the power button then the ionzyme button (or the +ion mode), then choose high or low. 2. Apply Pure C Liquid to skin. 3. Use it with the blade facing down (flat side). 4. Moving from the lower part of the face to the upper part of the face will have skin lifting effect. When finished, apply Richway's Cosmetic Code 3. Beautiful skin has a supple, soft, silky texture. Over time, the skin becomes rough, dry and less resilient. Rejuvena sL Ultrasonic System helps encourage the body's natural beauty rythms to restore a younger-looking appearance while bringing vitality and smoothness to the skin.